Date : Besancon (?) , ca 1350. Size : 5.7 x 8.5 inches. / 14.6 x 21.7 cm. Description :A very early double-leaf from a manuscript psalter on vellum. 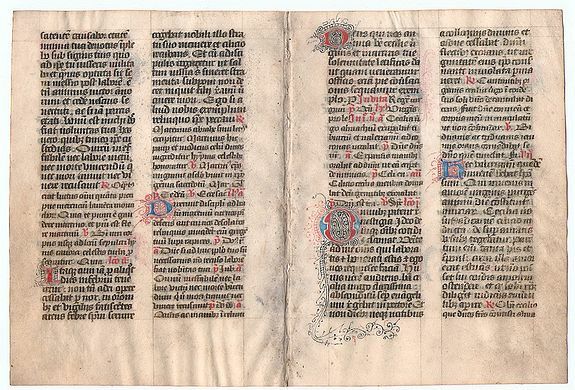 RECTO: 31 lines of text, double columns,in dark brown ink and in red, some panels in a slight larger script than the others, but by the same hand. One large 4-line initial "O" in the third column, in red and blue with pen-infillings in the same colours, blue penwork sprouting from the initial into the lefthand margin and extending into the bottom of page. four 2-line initials in blue or red with penwork uin the contrasting colour. VERSO: text as on recto, also partly panels in a slight larger script. Five 2-line initials in red and blue with penwork around and in them, in the contrasting colour. Condition : In very good condition, the stitching holes between the 2 leaves visible. Very slight thumbing in the bottom-right corner, not so though on verso. Ample (probably original margins. Good flat vellum.